I’m very excited about my cousin, Roy Mullins Jr., helping me out in an attempt to archive The Northwest Georgia Music Hour shows. I’m still working out a few kinks but if you would like to sample the new archive page you can visit this link here. 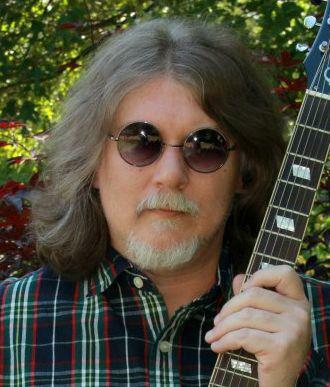 Local singer/songwriter/producer Gene Brigham joined us on last week’s show (9/18/13). We had a great time and this recording happened to be the first that I have added to the archive page. So he is our guinea pig. Thanks a lot, Gene! It’s a shame that the First Friday Concert Series is wrapping up this Friday, but the season is definitely going out with a bang. 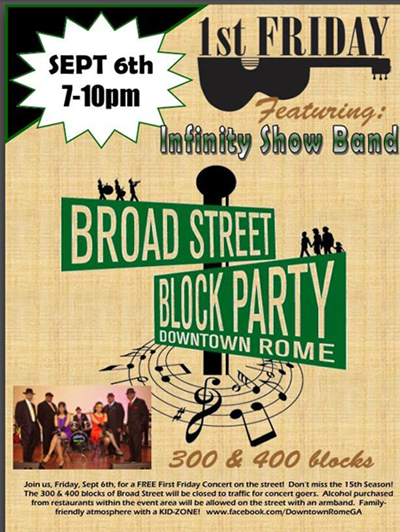 It’s going to be another Broad Street Block Party in which the 300 and 400 blocks of Broad Street will be closed off to vehicle traffic and folks will swarm in for a live concert by the Infinity Show Band. They performed last year at one of the concerts at Bridgepoint Plaza and everyone had a great time. So come on out and we’ll see you there! To find out more information on the Block Party visit the Downtown Rome, GA facebook page. You are currently browsing the The Rumpus Compendium blog archives for September, 2013.